Make these quick smashed Greek potatoes with feta and rosemary whenever you need a delicious side dish in a hurry… or add some protein and turn it into a main. Taking a break from the never ending parade of festive recipes to offer this quick dish that will delight year-round. Smashed potatoes are one of life’s great joys – so crispy on the outside, so deliciously fluffy and soft within. Basically they are an upgrade on the humble jacket potato and, using this method, a much faster one too. My trick with smashed potatoes is to blast them in the microwave until softened enough to smash. This can take between 7-12 minutes depending on your microwave’s wattage and the size of the potatoes you use. Don’t forget to rinse the potatoes and to pierce the skin all over with a sharp knife. Place the potatoes in a microwaveable bowl and then cover with moistened paper towel so that they don’t dry out. Cook for 6-7 minutes on full power and then check. If a knife pierces them easily you can probably proceed to the next step which is crisping them up in the oven. I usually find they need another few minutes before you can smash them easily. Once the potatoes are soft enough smash them with a potato masher to expose some of the soft flesh and then drizzle them with olive oil and season generously before transferring to the oven to crisp them up. A skillet is a great way to cook them but a tray will work as well. The feta, onions and capers go in at the very end so that the cheese has a chance to soften slightly. These quick smashed Greek potatoes with feta and rosemary are basically a winter version of my mum’s famous Greek potato salad and I know you will LOVE them. But you can also add any ingredients and spices that take your fancy – the potatoes can carry most of them with ease! By the way this method of microwaving the potatoes before smashing, which I also employ on roast potatoes as well, caused my husband to call this recipe ‘cheating’ which I naturally took great offence at! If technology makes your life a little bit easier I am all for it and this means I can serve the kids jacket potatoes for their dinner without having to cook them for hours first. If you want to make jacket potatoes in the microwave, rinse them, pierce them several times with a knife and then wrap them in slightly damp paper towel before microwaving them for about 6 minutes on each side. Large potatoes might need a little longer and remember to put them on a plate otherwise hot spots can cause the skin to dry out in places. 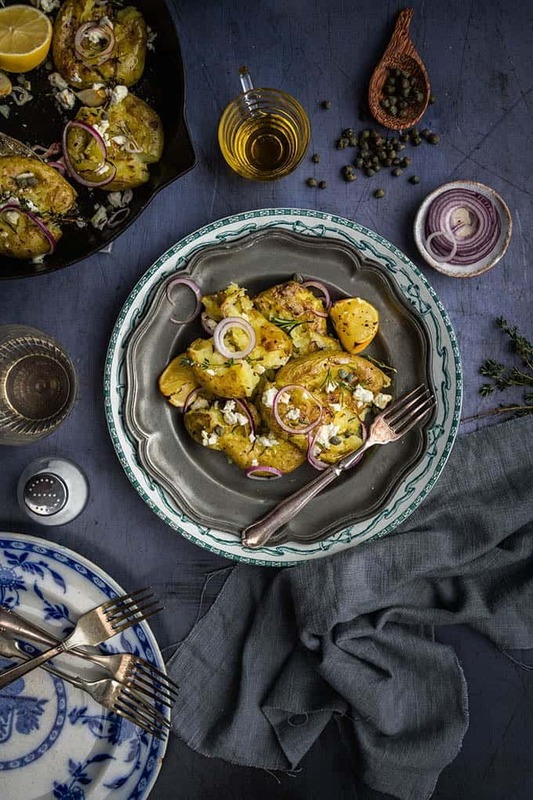 These Greek smashed potatoes are fantastic as a side dish, but can become a main meal if you add some puy lentils or some tinned tuna. The potatoes even taste great reheated the next day or you can turn leftovers into a salad. They are really an all-round winner. These quick smashed Greek potatoes with feta and rosemary taste totally delicious and require so little effort. Preheat the oven to 200C (400F). Drizzle a large skillet or roasting tray with a little olive oil. Rinse the potatoes and then pierce them all over with the tip of a sharp knife. Place in a microwaveable bowl, cover with two sheets of damp paper towel and microwave on full power for 7-12 minutes. You may need to do this in batches depending on your microwave's capacity. Check the potatoes after 7 minutes. If you can easily pierce them with a knife, take them out now otherwise continue to cook. Place the potatoes in the skillet or tray and smash them using a potato masher. You want to expose some of the flesh but for the potatoes to keep their shape. Drizzle with olive oil and season with salt and pepper. Scatter the garlic and rosemary over the potatoes and nestle the lemon wedges among them. Cook for 10 minutes until the skin starts to colour. Add the crumbled feta, onion and capers and return to the oven for a further 5 minutes. Squeeze some of the roasted lemons over them and serve immediately. Allow 2-3 medium potatoes per person. Overall cooking time may depend on how powerful your microwave is. This sounds amazing, i need them in my life!